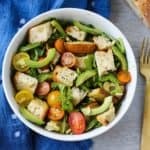 Why did it take me so long to make Panzanella salad? 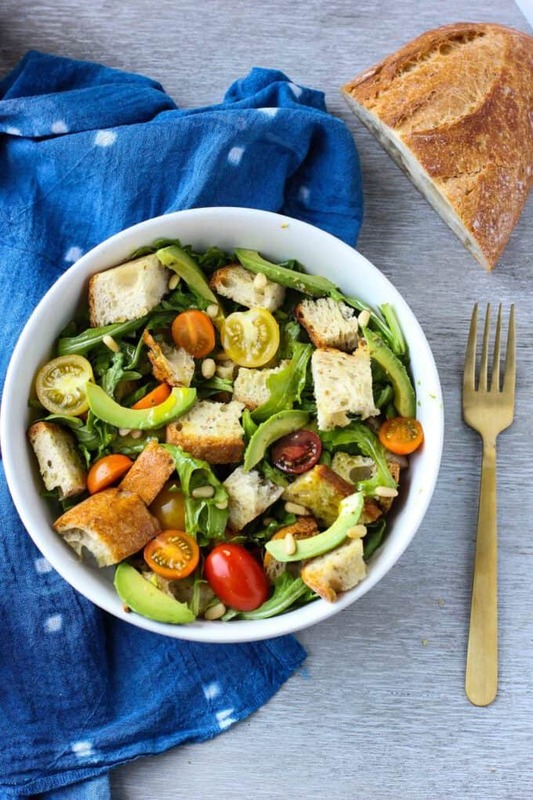 As someone who loves salad and crusty bread it’s kind of a no brainer. I spotted a Panzanella salad recipe in Bon Appetit and I couldn’t get it out of my mind. Their version wasn’t vegetarian and I wanted to simplify it so the end of summer tomatoes could really shine. I’m so happy with where this ended up and it turned out to be a delicious dinner. 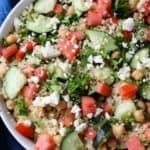 This would be a great side dish with just about anything but I ate mine as a main dish and it was quite satisfying. 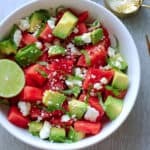 I had perfectly ripe avocados and deliciously sweet tomatoes. Both are essential for this dish! Since it’s full of produce, healthy fats, and crusty bread, it’s quite filling. This is also a great way to use up stale bread. Obviously, you can toast a fresh loaf and it’ll be delicious but it works just as well with bread that is a little dry. Anytime I have leftover bread, I pop it in the freezer. 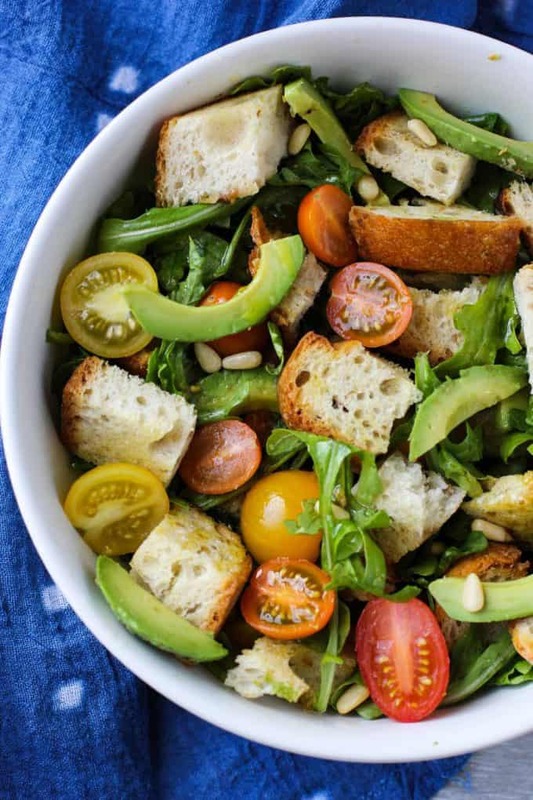 You can easily defrost it in the oven and then slice and toast it for a salad like this! 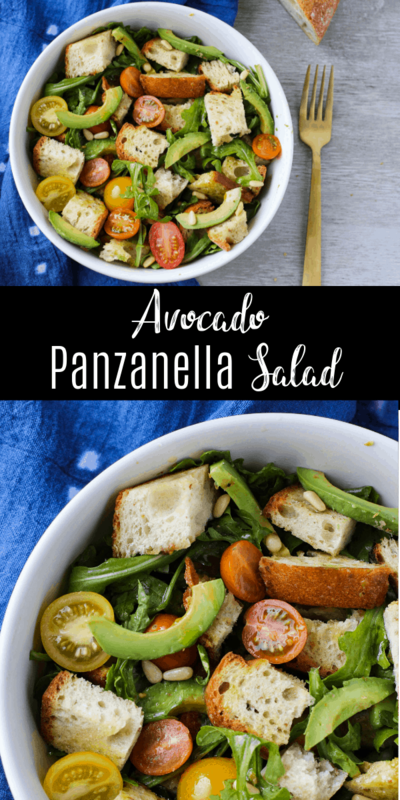 This avocado Panzanella salad makes a filling and delicious dinner! It’s perfect for a busy weeknight or when you have a loaf of crusty bread to use up! Drizzle two teaspoons of olive oil evenly over the bread. If you have olive oil spray, that’s a great way to evenly coat the bread without having to use a lot of oil. Bake the bread for 5 minutes then add the pine nuts to the pan, flip the bread over and toast the other side. Let the bread cool slightly. 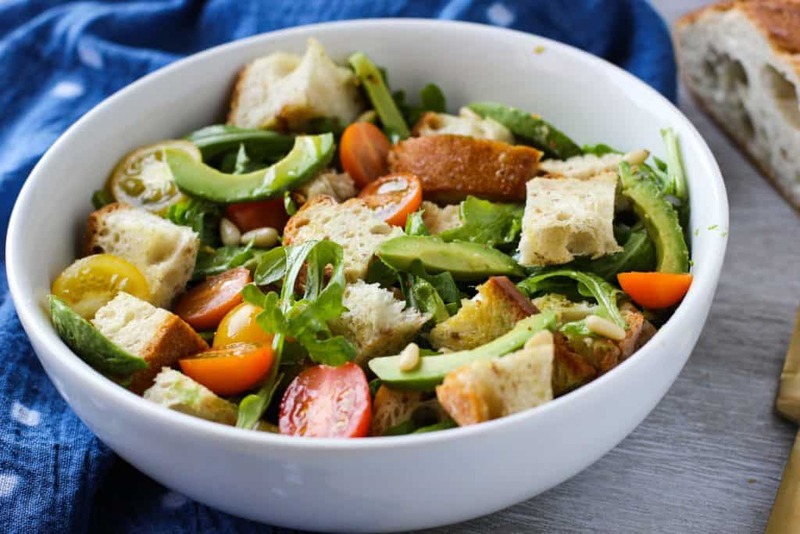 In a large bowl, combine the bread, pine nuts, avocado, tomatoes, and arugula. Drizzle with the remaining olive oil and sprinkle with salt and pepper. This was such a tasty but simple salad. I ended up making it twice in the same week because I couldn’t get it out of my mind! I used Billy Bread, a crusty loaf from a local bakery here, but you could use any crusty bread you enjoy. I’d also recommend the arugula because it adds a nice peppery flavor to the salad, but you can use any mixed greens you have on hand! While I loved this as a main course, it can also be served as a salad. If you’d rather serve this as a side dish, why not pair it with last week’s 15 minute dinner recipe? 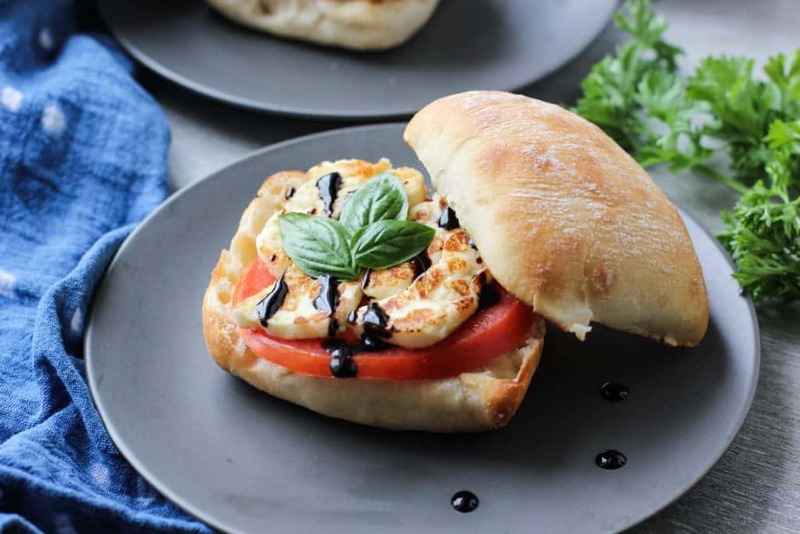 After all, these halloumi sandwiches would be good with pretty much anything! Enjoying this 15 minute dinner series? Click here to subscribe to my email list so you never miss a recipe! 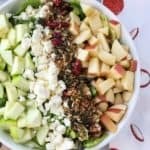 What’s your favorite type of salad? 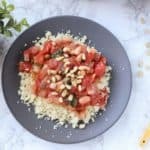 This recipe is something my girlfriend would love! She’s all about salads like this. We’ve been taking turns on who makes lunch. Wednesday is my turn so I think I might just have to make this for her. Thank you! oh yummy yummy!!! This looks absolutely phenomenal ! I love what you did with the bread- genius! Why have I never made this? It looks and sounds amazing. panzanella is one of my favssss and i do a fall variation with roasted veggies, pepitas, and goat cheese with simple garlicky vinaigrette. you may enjoy that.